Mud (now Mud II) are an English glam rock band, formed in February 1966. Their earlier success came in a pop and then glam rock style, while later hits were influenced by 1950s rock and roll, and are best remembered for their hit singles "Tiger Feet", which was the UK's best-selling single of 1974, and "Lonely This Christmas" which reached Christmas number 1 in December 1974. After signing to Rak Records and teaming up with songwriters/producers Nicky Chinn and Mike Chapman, the band had fourteen UK Top 20 hits between 1973 and 1976, including three number ones. The band was founded by lead guitarist Rob Davis (born Robert Berkeley Davis, 1 October 1947, Carshalton, Surrey), lead vocalist Les Gray (born Thomas Leslie Gray, 9 April 1946, Carshalton, Surrey; died 21 February 2004, Lagos, Portugal), drummer Dave Mount (born David George Mount, 3 March 1947, Carshalton; died 2 December 2006, St Helier's Hospital, Carshalton), and bassist Ray Stiles (born Raymond John Stiles, 20 November 1946, Guildford, Surrey). The band released their debut single "Flower Power" on CBS in 1967, but were not immediately successful. Three further singles in 1967/68, "Up The Airy Mountain"/"The Latter Days", "Shangri-La"/"House On The Hill" and "Jumping Jehosophat"/"Won't Let It Go", made no impression on the UK Singles Chart. The band appeared on the Basil Brush Show on BBC TV, and toured as support for Jack Jones. After years of unsuccessful singles, they were signed to Mickie Most's Rak label, and had three Top 20 successes in 1973 with "Crazy" (No. 12), "Hypnosis" (No. 16) and "Dyna-mite" (No. 4). At the peak of their career they also enjoyed British number one singles with "Tiger Feet"; and "Lonely This Christmas" (1974), an affectionate Elvis Presley pastiche; plus "Oh Boy" (1975), a cover of the Buddy Holly hit, which also featured on their album Mud Rock Volume 2. "Tiger Feet" sold over 500,000 copies in the UK and a million copies globally. Like contemporaries Sweet, their most successful period came when their records were written and produced by Chinn and Chapman, and in 1975 they had seven singles in the UK Top 40 totalling over 45 weeks on the chart, the most by any artist in 1975. "Oh Boy" was the only number one single produced by Chinn and Chapman that they did not also write. "Lonely This Christmas" gets seasonal airplay on British radio and television, (along with Slade's "Merry Xmas Everybody" and Wizzard's "I Wish It Could Be Christmas Everyday"). The band also embraced the burgeoning disco craze, as exemplified on their 1976 single "Shake It Down" which reached No. 12 in the UK chart. After "Tiger Feet" they released "The Cat Crept In" which reached No. 2 in April 1974, which was written to exploit Les Gray's vocal impression of Presley. Their next single "Rocket" reached No. 6 in the UK, after which they released another track from their album Mud Rock, a cover of "In the Mood". This was released under the name of "Dum" ("Mud" spelt backwards), but it failed to chart. After the success with "Lonely This Christmas", they cracked the Valentine's Day market with "The Secrets That You Keep", which reached No. 3 in February 1975. Around this time Mud wound up their contract with Rak releasing three further singles, "Oh Boy" (their third and final UK No. 1), "Moonshine Sally" (No. 10) and "One Night" (No. 32). Mud also split from Chinn and Chapman in mid-1975 and signed to Private Stock (licensed to Philips in Continental Europe). There they enjoyed three more British Top 20 hits within seven months: "L-L-Lucy" (No. 10), the ballad "Show Me You're A Woman" (No. 8) and the disco-influenced track "Shake It Down" (No. 12). The latter two singles saw them gradually moving away from glam rock, which was now unfashionable. Keyboardist Andy Ball, formerly of Candlewick Green, joined the band briefly during this period, to be replaced in early 1978 by Brian Tatum. Their last single to reach the British charts was a cover of the Bill Withers song "Lean on Me" which reached No. 7 in the UK in December 1976. This was followed by Gray's solo version of "Groovy Kind of Love" on Warner Bros., which peaked at No. 32 in the UK. In 1977, with Private Stock in financial difficulties, the band moved to RCA. Their first single on that label was "Slow Talking Boy", a folk rock song composed by John Kongos, and featuring Davis playing a Vox 12-string guitar-mandolin; they performed this song on BBC TV's Top of the Pops, but without reaping any chart success. Mud's next single, "(Just Try) A Little Tenderness", was their final appearance on any major national chart, stalling at No. 98 in Australia. Three more singles, all cover versions, followed in 1978 before RCA dropped the band and Gray quit for a solo career; the original band continued for a short while with female vocalist Margo Buchanan in Gray's place, releasing an unsuccessful single for Carrere, before finally disbanding in 1979. Following the band's dissolution, Stiles went on to join the Hollies; whilst Davis went on to co-write several highly successful dance hits for Kylie Minogue and Spiller featuring Sophie Ellis-Bextor. Drummer Mount went into the insurance business. Mount appeared on an episode of Never Mind the Buzzcocks on BBC Two in November 2005, and featured in the "spot the pop star of the past" identity parade segment. Mount died on 2 December 2006. He had been married twice and worked as a salesman latterly. His obituary appeared in The Independent newspaper. The last performance by the four original members was on 3 March 1990 at Dave Mount's wedding; a video recording of which was made by Mount. After the original band broke up in 1979, Gray reformed the band as 'Les Gray's Mud'. The initial lineup featured Stuart Amesbury (rhythm guitar) and Cherie Beck (backing vocals) of the Bristol-based Cherie Beck Band; together with Dale Fry (bass), Rob John (drums), and Nick Richie (lead guitar); with the latter two being replaced in 1983 by guitarist Tim Fish and drummer Mark Hatwood respectively. In 1985 a further lineup change saw Amesbury, Beck, and Fry depart the band; with the new lineup being rounded out by Kevin Fairburn on bass. In 1987 everyone with the exception of Gray departed the band, and Gray brought in bassist John Berry, drummer Wole Rothe, and guitarist Syd Twynham as replacements. Rothe and Twynham had both been members of Liquid Gold prior to joining Mud. This lineup lasted until 1998 when Rothe was replaced by Phil Wilson, and the band underwent no further changes until the death of Gray in 2004. 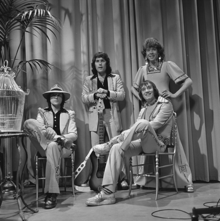 Following Gray's passing, the three remaining members were given permission by the other founding members of Mud, plus that of Gray's family, to continue using the band's name. Berry, Twynham, and Wilson then rechristened the band 'Mud II' and recruited keyboardist and longterm Mud collaborator Chris Savage. The following year Berry left and was replaced by Marc Michalski, creating the lineup of the band which still continues to this day. A short version of "Tiger Feet" was played at the opening ceremony of the 2012 Summer Olympics. "Dyna-mite", "Rocket", "The Secrets That You Keep", "The Cat Crept In", "One Night", "Oh Boy", "Tiger Feet", "Hypnosis", "Moonshine Sally", "Crazy" and "Lonely This Christmas"
"Shake It Down", "It Don't Mean A Thing", "Under the Moon of Love", "Sweet and Sour Lady", "Show Me You're A Woman", "Beating Round The Bush", "L'L'Lucy", "Nite on the Tiles", "Use Your Imagination", "Lean on Me"
"The Night Has A Thousand Eyes", "(Let Me Be) Your Teddy Bear", "(Till) I Kissed You", "Save The Last Dance For Me", "Only Sixteen", "Sealed with a Kiss", "Lipstick on Your Collar", "From a Jack to a King", "My Boy Lollipop", "Ain’t That A Shame", "Don't Ever Change", "Let's Dance", "Under The Boardwalk", "Itsy Bitsy Teeny Weeny Yellow Polka Dot Bikini", "Dream Lover", "She Wears Red Feathers", "Poetry in Motion", "Blueberry Hill", "Shakin' All Over", "Lucille"
"Crazy", "Hypnosis", "Dyna-mite", "Tiger Feet", "The Cat Crept In", "Rocket", "Hippy Hippy Shake", "The Secrets That You Keep", "Oh Boy", "Moonshine Sally", "One Night", "Blue Moon", "End of the World", "Tallahassee Lassie", "Let's Have A Party", "Living Doll", "Diana", "In The Mood", "Hula Love", "Lonely This Christmas"
^ a b c d e f Roberts, David (2006). British Hit Singles & Albums (19th ed.). London: Guinness World Records Limited. p. 382. ISBN 1-904994-10-5. ^ a b c d e Murrells, Joseph (1978). The Book of Golden Discs (2nd ed.). London: Barrie and Jenkins Ltd. p. 348. ISBN 0-214-20512-6. ^ "Stephen Glover: A prissy judgement by the PCC". The Independent. London. 20 September 2010. Archived from the original on 8 January 2007. ^ Rice, Jo (1982). The Guinness Book of 500 Number One Hits (1st ed.). Enfield, Middlesex: Guinness Superlatives Ltd. p. 167. ISBN 0-85112-250-7. ^ Eder, Bruce. "Mud - Music Biography, Credits and Discography". AllMusic. Retrieved 2013-07-05. ^ a b "The MUD Story - The Cast". Mudrock.org.uk. 1947-10-07. Retrieved 2013-12-01. ^ a b c "Mud Discography - UK". 45cat. Retrieved 2013-12-01. ^ "Mud - Slow Talking Boy". YouTube. 2011-11-27. Retrieved 2013-12-01. ^ Steffen Hung. "Forum - Top Singles of 1977 (Personal Charts: Your Special Occasion Charts)". australian-charts.com. Retrieved 2013-12-01. ^ "Dave Mount". The Independent. London. 18 December 2006. Retrieved 13 May 2010. ^ "Stargazer". Bristolarchiverecords.com. Retrieved 2016-06-27. ^ "Archived copy". Archived from the original on 17 November 2015. Retrieved 14 November 2015. ^ "Archived copy". Archived from the original on 4 March 2016. Retrieved 14 November 2015. ^ "Mud Discography - UK - 45cat". 45cat.com. Retrieved 16 January 2015. ^ "Mud Discography". Mudrock.org.uk. 16 March 2009. Retrieved 2012-08-23.